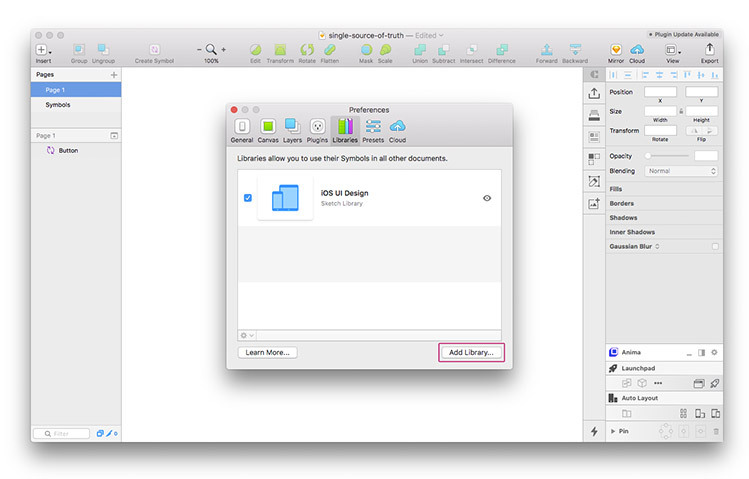 Sketch just made public the Sketch 47, and we finally have a document with symbols which can be used across other documents, so let’s see how to use libraries in Sketch. 1. Create a Sketch document with at least one symbol and save your document in Dropbox, Box, Sync or any other place where your colleagues have access. 2. 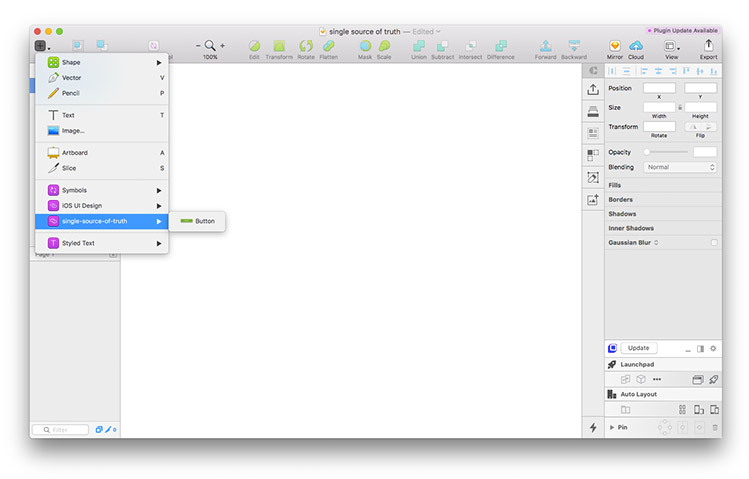 Press CMD + comma to open Sketch’s Preferences and navigate to the Libraries tab. 3. You’ll notice there is iOS UI Design library included, but we’ll create a new library. Click on the “Add Library…” button and choose your document. Congrats, you’ve just created a single source of truth for everyone in your team. 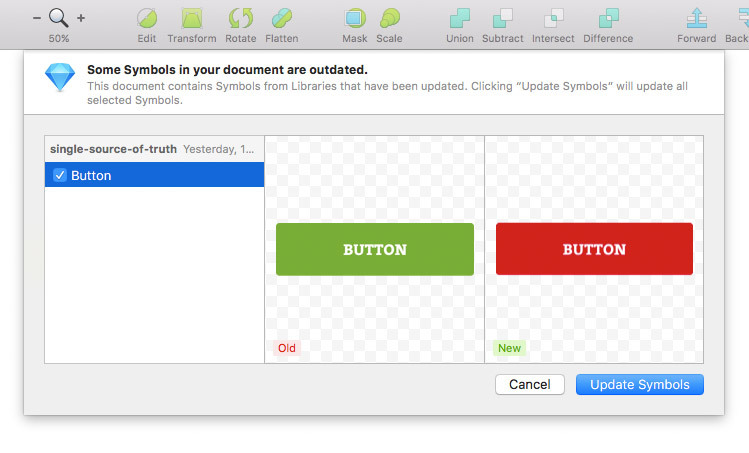 Team members can now easily add the Library by following the same steps mentioned above and access the symbols in that file from any Sketch file. Using shared library is simple and straightforward. Inserting symbols works just like inserting regular symbols, the only difference is they are not placed in your document. To insert a symbol just find your shared library at the bottom of the list on the Insert menu. You’ll notice external symbols have slightly different icons from the local symbols to avoid confusion. Once inserted, there are two options for editing an external symbol. You can unlink it from Library or open it in the Original document. If you choose “Unlink from Library”, it will detach from the external library and become a local symbol in your current Sketch file. Making changes in the original document will affect all instances of the symbol across any document which is using this library, but only if those changes are accepted. After making changes, everyone who is using this library will see “Library Update Available” badge on the top-right corner of Sketch. Maybe Sketch crew should make that badge more prominent because it’s easy to miss. Anyhow, clicking on it will display a dialog box with outdated symbols and an option to selectively update them. 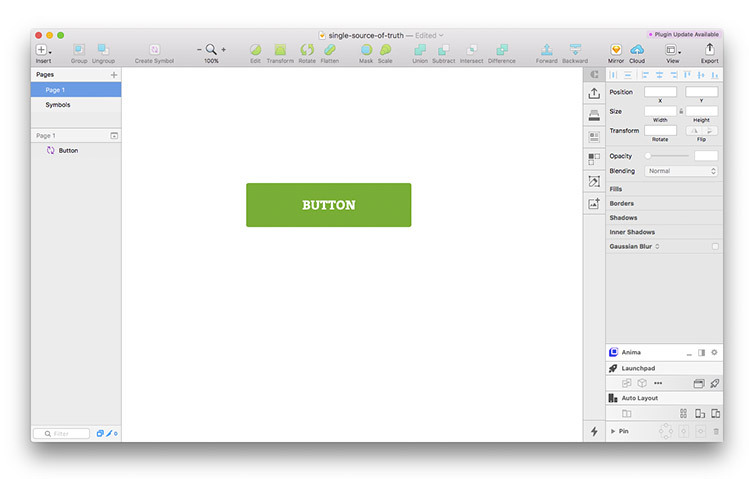 This feature is definitely a game changer for all Sketch users and it will change real-time collaboration permanently. What we would like to see in some of the future updates is an option to include text styles and layer styles in a library. Hey, thanks for this article. Very informative. I’m trying to identify the location of existing library file(s) in a Box storage environment, but I’m not having much success, though my colleagues have successfully set up libraries. I know that this is likely a Box issue, but thought that you or your team may have some insights for large teams working and accessing a common library. Hey Paul, unfortunately, I don’t have insight in your Box storage environment so I can’t help you. Our team has only one folder for all libraries and subfolders for each project so it is easy to identify the location of existing libraries. Hi Skali, interesting question, we just tried this and it looks like you will have to add that library again, but the good thing is symbols will be recognized so you won’t have to replace them. hi marko, thanks for sharing! I have still one question: how do you contribute new symbols to the shared library? Hi Philipp, I’m sure you know that adding new symbols to the shared library doesn’t require syncing, but I believe you were thinking about the process of adding new symbols and inconsistency issues with new elements. Our design team decided to have one responsible person for adding new elements to the library. We all can contribute with new symbols but only the library owner can add those new symbols to our library. 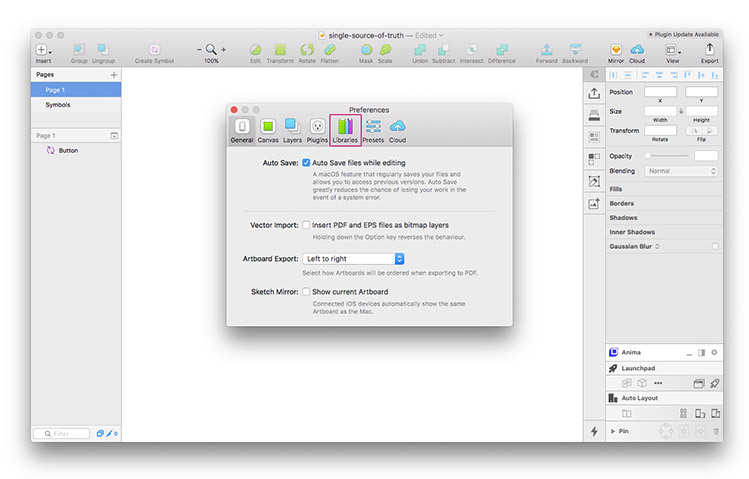 We all hope that Sketch will work on better version control in the future to make our lives easier. We also tried Abstract for versioning, but still not completely satisfied with it.